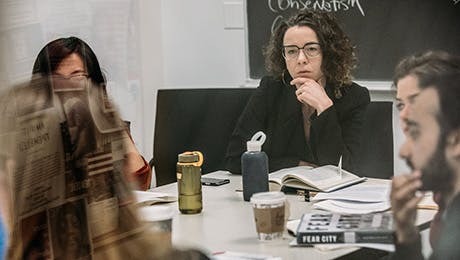 The MA in Sociology is a 30-credit program providing students with a thorough grounding in the historical, theoretical, and methodological development of sociology and gives students the tools to apply this knowledge in the world around them. The MA in Sociology prepares graduates for academic and professional careers in diverse fields, including government, NGOs, media, consulting, or further study and research at the doctoral level. Entering students work with an individual faculty advisor. This advisor, together with the departmental student advisor, introduces them to the curriculum as a whole and helps them to formulate the program that best suits their interests and needs. A full account of degree requirements and procedures is contained in the Sociology departmental handbook. To earn the MA in Sociology, a student must complete a total of 30 credits with a minimum grade point average of 3.0. At least 24 credits must be taken in courses offered by the Sociology department. Courses offered by other departments of The New School for Social Research that are cross-listed in Sociology may be used to meet the 18 required Sociology credits. Many cross-listed courses have prerequisites. The course instructor and the chair of the department or committee offering a course will determine whether a Sociology student meets the prerequisites and can be admitted to the course in question. Courses that are not cross-listed in Sociology may only be taken as electives. The remaining 6 credits are electives that may be taken within or outside the Sociology department. The department encourages students to avail themselves of the rich course offerings of the other departments of The New School for Social Research, but this should be done with appropriate guidance from advisors so as to maximize the coherence of the overall program of study. After taking and completing the four core required courses and at least 6 additional sociology credits, students are eligible to sit for the MA Examination. The MA written examination is meant to test graduate students' knowledge of general theoretical, methodological and substantive issues in sociology. Candidates for the terminal MA degree must receive a score of at least low pass. Students with an evaluation of high pass or pass receive approval to apply to the PhD program.